Agent Sam's my name....solving mysteries is my game! How cool is this? 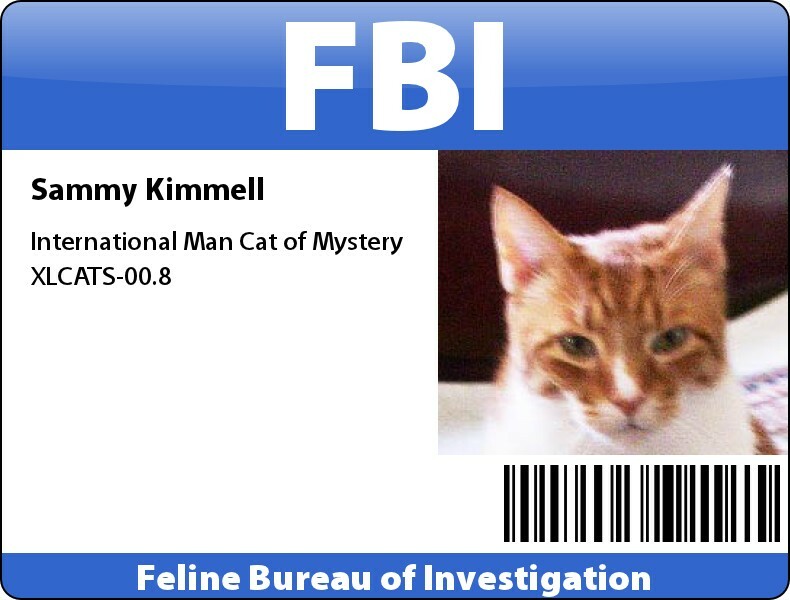 I’m now an official Feline Bureau Investigation special agent. I’ll be able to use my talent for solving mysteries gained through years of helping Mom write her mystery novel which was published a few years ago with MY help. I’ll also be able to help solve mysteries like “where’s Dad’s other sock? ?”…..or “where did I put that new mouse toy?”…..or even “who is that cat that crossed through my front yard every morning?”. How did I join up? Well, I met some new friends at Cat From Hell. There’s Penelope (known as Nellie), her brother Kozmo, and two dogs Nellie calls “Big Slobbery Sisters”. Kozmo’s the FBI agent and all I had to do was sent an email to him and in return I got this FABULOUS badge!! I’m so excited. Ever since Mom wrote her book “The Mystery of David’s Bridge” I’ve secretly wanted to be a special agent – sneaking around and spying is one of my specialties. I love to keep an eye on things – I should be purrrrrrfect for this job. If you scroll down on Cat From Hell’s blog to the post where Kozmo talks about one of his mystery-solving adventures, you’ll see how exciting it is to join up and help to solve crimes. You can get your OWN FBI badge and give Kozmo a hand when he needs it. I’m thinking maybe in addition to the beret I would like to have for Christmas this year, I might consider asking for a “Sam Spade” type fedora too. A guy has to have an image if he’s a special agent right?